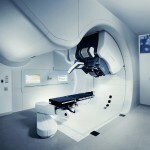 In a recent study published in BMC Cancer, titled “Prognostic information of serial plasma osteopontin measurement in radiotherapy of non-small-cell lung cancer”, a team of researchers fromMartin Luther University, Germany, studied the role of the protein osteopontin (OPN) in radiotherapy of lung cancer. Previous studies have associated the circulating levels of OPN as a prognostic marker for clinical outcome in chemotherapy and surgery of lung cancer patients. However, not much is known regarding the role of this hypoxia-related plasma protein in radiation therapy. As such, the researchers designed a prospective clinical study whereby they sought to determine if serial OPN measurements during and after curative-intent radiotherapy for non-small cell lung cancer (NSCLC) patients could provide supplementary or better prognostic information. 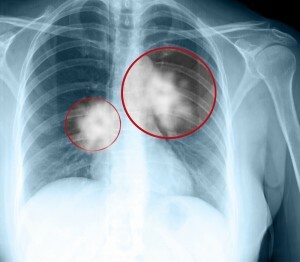 A total of 69 patients diagnosed with inoperable NSCLC were enrolled in the study. The plasma levels of OPN were measured before, at the end and 4 weeks after radiation therapy treatment. The levels of OPN were monitored throughout the duration of the treatment and correlated with prognosis. The results demonstrated that OPN levels before treatment were associated with lung function, weight loss, tumor volume and hemoglobin concentration. Patients who had distant metastasis, had significantly higher levels of OPN at all the different time points analyzed. 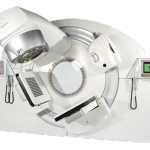 Subjects who had their OPN levels increased after radiation therapy had a diminished freedom from relapse, overall survival and disease-free survival, when compared to those who presented constant or declining OPN levels. Furthermore, the team found that the risk of relapse was almost 3 times higher for individuals with increasing or stable OPN levels after radiation therapy, along with an increased risk of death. These results indicate that OPN levels have the capacity to change over time, especially after radiation treatment, allowing extra prognostic information in curative-intent radiotherapy of NSCLC. However, as the authors note in their study, “certain limitations should be considered when evaluating the results of this hypothesis-generating study. Despite the homogeneity of the patient cohort, the relatively small patient number underlines the exploratory character of our work. Also, evaluation of our results in an independent data set would be desirable and since OPN may not be considered a direct surrogate of tumor hypoxia, a correlation with other surrogates of tumor oxygenation such as hypoxic (PET) imaging or other hypoxia markers would be useful “.